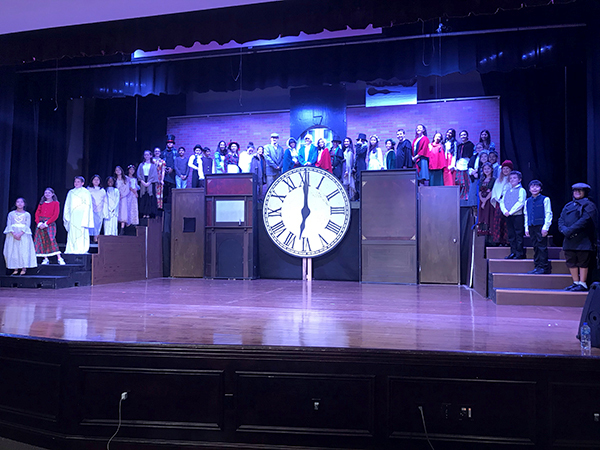 On December 14, 2018 the cast, crew, and staff of Green Brook Middle School’s A Christmas Carol ended their incredible production with a show-stopping final performance. This play included over 65 cast and crew members who worked diligently to convey the Dickens classic. This was one of the most ambitious set designs from director Mr. William Alzaher, who employed the help of some wonderful parents who volunteered their time, tools, and expertise to help see it come to fruition. The show was narrated by Aria Anthony and Sarai Gonzalez and starred Ben Cupit as Scrooge, Vincent Miller as Bob Cratchet, Nadine Greybek as Fred, Leina Staudinger as Ghost of Christmas Past, Grace Wang as Ghost of Christmas Present and Lucas Flint as Jacob Marley. The final show concluded with a wonderful cast party enjoyed by all cast and crew members which was hosted by a group of parent volunteers. The show was directed by the school’s chorus and orchestra teacher Mr. William Alzaher and the backstage crew was managed by Mrs. Erin Ferrara. We’re so incredibly proud of all the students involved and would like to thank the parents who volunteered with supervision, the cast party, set building, photography, tshirts, painting, publicity and more. Another big thank you to the teachers, staff, administration, and Board of Education for coming out to enjoy the show and support the hard work the directors, cast, and crew have put in over the last 3 months. Bravo to the cast and crew!